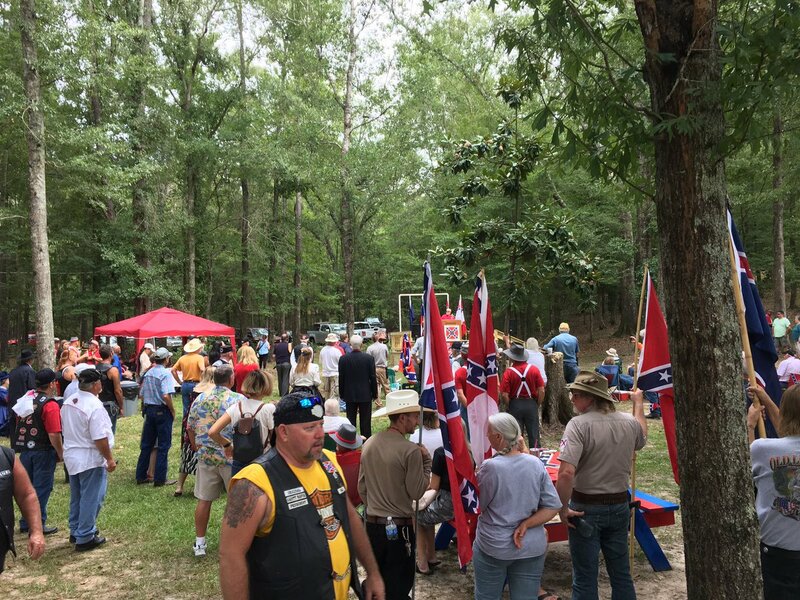 More than 200 people attended an unveiling ceremony for a new Confederate monument Sunday afternoon in Alabama’s Crenshaw County. 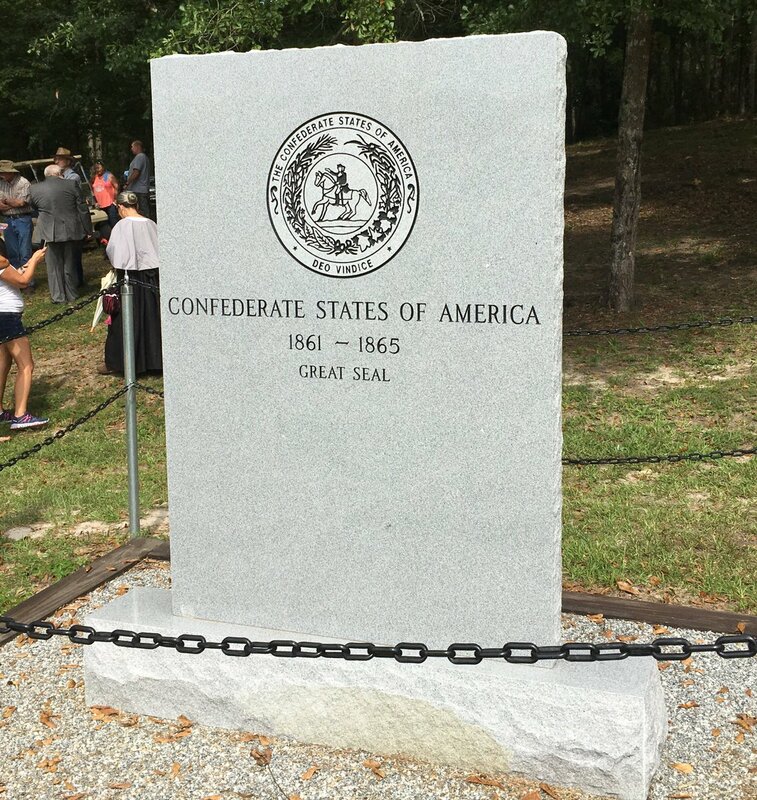 The modest stone marker commemorates the “unknown Confederate soldiers” who died in the Civil War but have been forgotten by history, particularly those from Crenshaw County and the surrounding area. 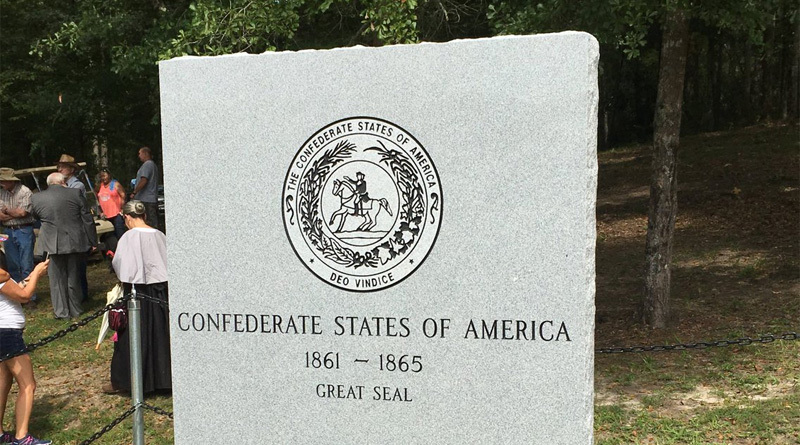 The memorial now stands in a confederate memorial park first opened in May 2015 on private land in an unincorporated area next to Dry Creek RV Park about three miles north of Brantley. It sits among existing monuments, replica cannons and tall flagpoles flying Confederate and other flags. “That’s why we’re here is to honor our Confederate dead, to honor our ancestors,” David Coggins, a Sons of Confederate Veterans member who operates both the RV Park and the adjacent memorial park, told the energetic crowd during introductory remarks he made from a wooden stage. Speakers and attendees repeatedly stated that the memorial and ceremony were not responses to the racial discord currently gripping the nation. They said it was just a coincidence that the date of the event was announced online shortly after a white nationalist ran over and killed a woman in Charlottesville, Virginia, following violent demonstrations there earlier this month. Slapout resident Vann Royal said he has been a member of the Sons of Confederate Veterans in Tallassee, Alabama, for more than 20 years. He said he was there to remember the soldiers who lost their lives fighting for the Confederacy and support the ongoing movement to do so. 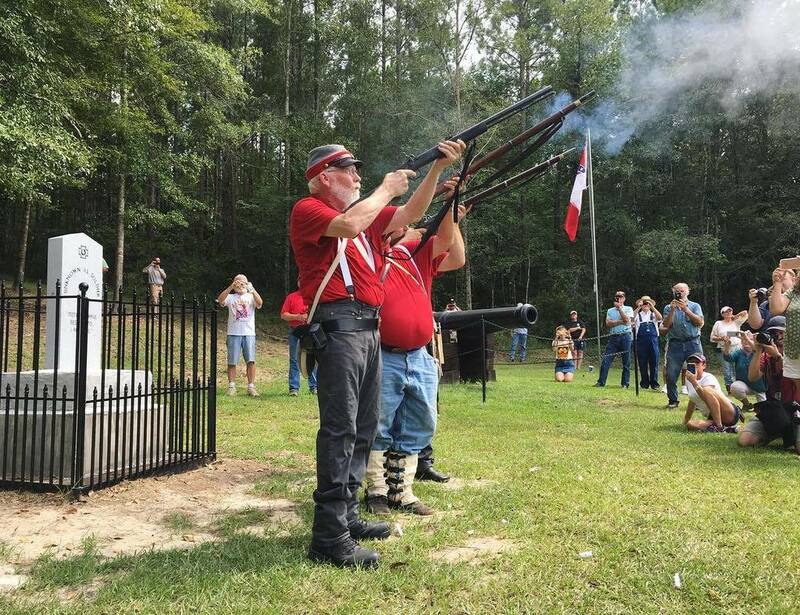 Dozens of attendees wore Confederate T-shirts, black-leather motorcycle jackets or similar attire, while some men dressed up for the occasion in Confederate soldier uniforms and several women wore period costume dresses. Many in attendance waved Confederate flags and other banners associated with the Confederacy and the South. About 10 members and affiliates of the right-wing Three Percenters militia movement stood in the back, wearing camouflage fatigues and body armor and carrying large guns; a member said they were there “in case anything were to happen.” Coggins asked for donations to support the construction of a future monument to the Confederate Navy. 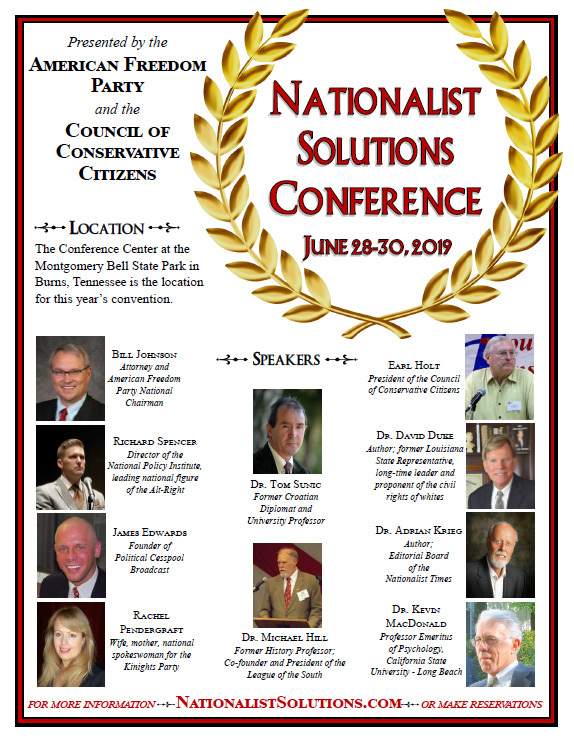 The event – which AL.com was barred by organizers from bringing video cameras or cameras other than cellphones into – kicked off with a series of speeches followed by a flag-raising ceremony and an approximately 10-minute period during which attendees called out names of Confederate veterans who lost their lives in battle and where and how they died. Once the ceremony concluded, members of the crowd mingled for a time as more blanks were fired from multiple replica Civil War cannons. Wendy Osborne, a Tallassee resident and member of the Talisi Cotton Belles, a local chapter of the Order of Confederate Rose, said she was glad to see so many people come out in support of the Confederacy in a time when such groups face widespread derision and criticism. It’s very important that those of us in the Freedom Movement become equally creative at preserving Southern and Confederate Heritage, in order to counter the assaults of the trousered apes, communist Jews and queers who assail them both.